The Focke-Wulf Fw 190 and Ta 152-A Complete Guide To The Luftwaffe’s Last Piston Engine Fighters By Richard A Franks will roll off the presses on March 22. We are working hard to get it ready in time for the Southern Expo show in Hornchurch, UK. Owing to the sheer weight of information available on both types we have taken the decision to expand the book from 128 to 164 pages. Cover price remains at £17.95 per copy and we are holding mailing rates at preorder levels up till publication date, after which they will be reviewed. In addition to potential postage savings there are a few more days remaining for you to get your order in and have a chance to win one of eleven Fw 190 or Ta 152 kits from Eduard, HobbyBoss or Zoukei –Mura. 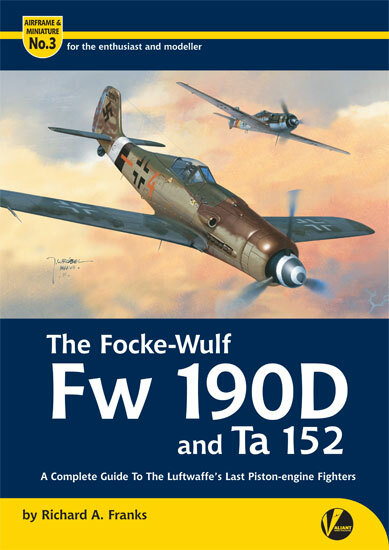 The Focke-Wulf Fw 190D & Ta 152 – A Complete Guide To The Luftwaffe’s Last Piston-Engine Fighters is also available from all good specialist bookshops, retailers and ADH Books.